Screenplay: Eduardo Sacheri, Juan José Campanella. Starring: Ricardo Darin, Soledad Villamil, Guillermo Francella, Pablo Rago, Javier Godino, José Luis Gioia, Carla Quevedo. The 2010 Academy Awards category for Best Foreign Language film contained some strong contenders with the likes of Jacques Audiard’s “A Prophet” and Michael Haneke’s “The White Ribbon“; two films that could easily have laid claim to the award. However, it was this film that crept up from under their noses and took the Oscar. Whether or nor you pay any credence to the Oscars is neither here nor there as there’s no doubt that this is solid and absorbing filmmaking. In 1999, retired criminal justice officer Benjamin Esposito (Ricardo Darìn) decides to write a novel about a murder case that he investigated in 1974. He decides to visit his old colleague Irene Hastings (Soledad Villamil) to talk it over. The case had repercussions for everyone involved but Benjamin didn’t realise the direct effect it had on him or his deep, suppressed feelings for Irene. 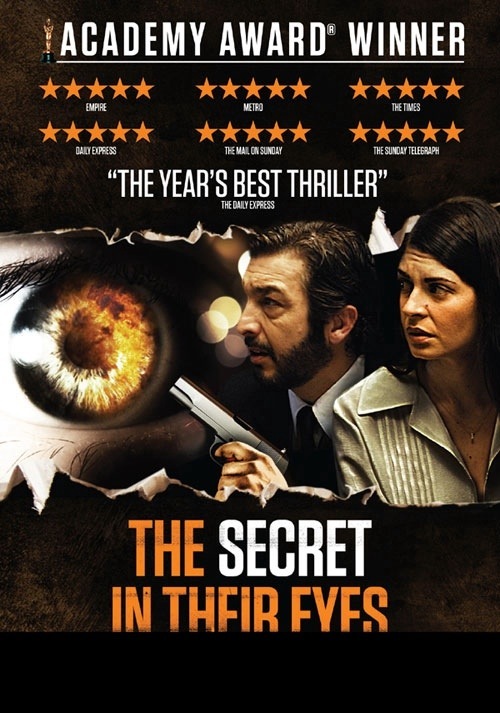 With a title like “The Secret In Their Eyes“, this film states it’s intentions and stands by them. Director Juan José Campanella lingers long on shots and wisely focuses on the eyes of his performers. For a film that’s predominately dialogue driven, the abundance of close-up’s add another dimension where the eyes speak a thousand words. It’s a great technique that conveys a myriad of hidden meanings in the relationship between the two main characters, Benjamin and Irene. However, this relationship is not entirely apparent from the off-set. It’s only when the film’s layers are revealed that this comes to the surface, as in the meantime you’re too preoccupied with it’s murder-mystery plot developments. This mystery progresses into a manhunt, while taking time to explore the judicial system and political corruption that was rife in Argentina in 1970’s. It’s during this, that Campanella takes advantage of the thriller element in the story, delivery an absolutely astounding and very skilfully handled tracking shot through a football stadium, leading to an impressively assembled chase sequence. Just how they managed to do it is beyond me and needs to be seen to be believed. There are many moments of intensity when it matters (including a nerve-racking elevator moment that’s hard to forget) but it also knows how to ground itself and that’s were the performances come in; Ricardo Darin is a charismatic presence who more than holds your interest with unshakable ideals and a strong moral compass, while Soledad Villamil delivers a strong and reserved show. It’s the chemistry between these two wonderful actors that play a big part in the film’s, effortless, tonal shifts. It’s also not without humour or tragedy which is provided by Guillermo Francella as Benjamin’s alcoholic, but loyal and reliable colleague, Pablo. Quite simply, it’s easy to see why this film took the Oscar, it’s has a bit of everything; a sharp and involving script that pays great attention to detail; skilful direction; rich cinematography and natural, committed performances. A complex tapestry about life, love and chances rued, that’s built around the constructs of a thriller. It excels in everything it challenges and that’s exactly where it’s strengths lie. This entry was posted on May 4, 2013 at 4:16 pm and is filed under Drama, Foreign Language, Mystery, thriller with tags 2010. You can follow any responses to this entry through the RSS 2.0 feed. You can leave a response, or trackback from your own site. First review I have seen of this film, but it sounds like something I should check out. Thanks for the heads up. Definitely worth a look Adam. It had been on my cards for a while but I struggled to get my hands on it. I’m even sure if many people have seen or heard of it but I’m hoping it’s Oscar win brought it to people’s attention. It shouldn’t be overlooked. Mark does that mean it is not available for streaming? I’ve no idea, man. I don’t do streaming. I got hold of it on DVD. Trudged through the world cinema section. no streaming ???? wow poor streaming services or just not into it? I’ve just not looked into it, to be honest. I will do at some point, though. It sounds worthwhile. I am streaming via Amazon, Netflix, and Hulu and a few other pay to view like Vudu and Itunes. Those last two sometimes have films still in theaters to stream. Nice listing here Adam. Netflix was the only one I was thinking of but I like the sound of the last two, especially if they’ve got the latest stuff. Cheers, man. Nice write up Mark, I saw this one in the theater back when it came out and thought it was great. My only complaint was that the ending was a little bit predictable. It didn’t ruin my enjoyment of the movie though. Have you seen The Double Hour yet? I would be curious to know what you thought of it. Thanks Griff. It’s nice to hear from someone who’s actually seen it. It would seem that this has been overlooked quite a bit. I agree that the ending was a tad predictable but it was still a great journey getting there. I also thought that (very) slight over-length was an issue. That was the only reason I never gave it top marks. I thoroughly enjoyed it. Great review man, I’m trying to watch more foreign language films at the moment. I will check this out after reading this write up. Cheers Vinnie. I’m on the same course just now. I want to get through more foreign stuff myself. You should definitely make this one of your choices. It’s worth it, man. This sounds VERY intriguing indeed Mark. I hope it’s available on iTunes or Netflix so I can watch it. I always like foreign thrillers as I’m usually impressed with them, so thanks for the recommendation! I hope you do get to see it Ruth, I can totally understand why it took the Oscar. It has a lot of depth yet it doesn’t overcomplicate things. There are very few faults to be found and those that it does have are minuscule and easily forgiven. I’d love to hear what you think when you manage to catch it. “It has a lot of depth yet it doesn’t overcomplicate things” Wow, that’s quite a feat. I’m very curious to see it, I hope it won’t be as violent as The Prophet (based on what I hear it’s quite brutal). Oh good!! I read some reviews of The Prophet that made me cringe, I knew somehow I won’t be able to handle that one. I want to see this and also Tell No One. I really liked A Prophet. Thought it was a great movie but yeah, a little violent at times. Tell No One is very good as well but it’s been a while since I seen that. I’ll have to revisit that one again someday. Nice review buddy. I liked this film but it never really blew me away. I don’t mean to belittle it because you mention several of the things that I really liked about it. It’s a very solid flick. Aah! Another that has seen it? Nice one bro! Yeah, I really got into man. It delivered on so many levels for me. I believed it to be a thriller to begin with (which it was) but it went off in another tangent that I think worked entirely. I find it hard to find many faults with it. It did have a couple but overall a refreshing and original type of film. It’s been a while since I’ve seen it. You have me wanting to revisit it. I like that you mentioned the chase scene in the stadium. I do remember that and it was fabulous. Give it another shot, man. There are so many layers that it’s worth checking out again. Even though I tool plenty the first time around, I think I’d take more on a second viewing. That stadium scene is incredible. I’m still trying to work out how they actually managed that. Maybe I’m missing something, but the movement of the camera is impossible, surely.? Oh, badass. I’ve heard a lot of great things about this one, and I included it in my project this year. Now you’ve got me excited to check it out sooner rather than later. Great review, man! Cheers, man. I’ve been trying to see this for a while and I’m now finally glad to say I have. Brilliant film and completely understandable that it took the Oscar over some strong competition. Great review, Mark. I loved this film. One of my favorites from its year. Loved that you highlighted the elevator scene and the sequence in the football stadium. Those were AMAZING. Thanks Fernando. There’s a good chance it would make my favourites from it’s year also. Yeah, man. Those scenes in the stadium and the elevator were outstanding. The stadium scene alone would have went down as one the finest scenes from the year as well. On my Top Ten. It will floor any film fan. I went into it without any idea about it. By the end I was beside myself. I cried for, well, a long time. Powerful contrasts exist that hold the viewer at bay. Benjamin and Irenes romance are directly opposite the young murdered woman. The young woman’s is cut short before it really began, Benjamin and Irene wait a life time to begin. A sense of justice also stands in sharp contrast. How could the murderer get away with this crime? If caught, is the death penalty, really justice for the crime? There are metaphors here for the military junta of Argentinas past. They largely went unpunished. I think anyone with a distaste for subtitles owes it to themselves to dine on this feast of a film. They’ll never overlook foreign movies again. In your Top Ten Ray? That’s high praise indeed and very understandable. It’s such a marvellous film with an abundance of layers. I had heard a bit about it beforehand but it was still a surprise as it went in directions that I didn’t expect. It’s always a pleasure when you watch world cinema, you feel totally satisfied and that you’ve just had a thoroughly rewarding, cinematic experience. It’s a great movie buddy. I caught wind of it when it won it’s Oscar and beating “A Prophet” to get it. Well worth a watch. Nice review Mark. I thought this was a great film. The scene in the football stadium was amazing. Thanks man. Agreed. Excellent film and that stadium scene was something very special indeed. Sounds like a must-see Mark! I’d say it is Chris. This didn’t win the Oscar for nothing. I loved it. It is an all encompassing film that is absorbing, well acted, thoroughly entertaining, and kept me guessing as to its outcome until the end. Couldn’t have said it better myself. Fantastic film that worked on so many levels. Superb review Mark. Had this on my watch list for a while now (along with a million other things) and heard only good things about it. Definitely need to check it out. Cheers Chris. It had been on my list for ages as well. Glad I finally got a chance to see it, as it did not disappoint. Bump it up your list if you can, man. It’s worth it. Great review, Mark! I’ll have to see this one, it sounds great. Thanks Georgina. It is great and fully deserving of your time. If you enjoy it half as much as I did then you’ll do fine. Oh this is such a great movie. The twist in this one, the way it was executed and how it elevated the story, was one of the best I’ve ever seen. It was indeed great Sati. Glad to hear you’re a fan. I really hope those that haven’t seen this, give it a chance. I was completely engrossed in it. Marvellous stuff and it’s hard to disagree with it’s Oscar win. Couldn’t agree more my man. I absolutely loved it. It had a bit of everything going for it.